Julie A. Lockman, Ph.D., has been named director of faculty affairs and academic initiatives for WVU Health Sciences. Dr. Lockman served as a 2017-2018 WVU provost fellow for health sciences academic affairs. Lockman, also director of investigator development for the West Virginia Clinical and Translational Science Institute and a teaching associate professor in the School of Medicine’s Department of Physiology and Pharmacology, was appointed to the post by Clay Marsh, M.D., vice president and executive dean for WVU health sciences. 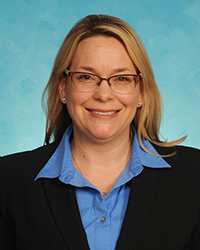 The half-time appointment began on July 1, and Lockman will also continue her administrative work with WVCTSI focused on investigator development through directing of the professional development core, investigator programming and the masters and certificate programs in clinical and translational science. Lockman will work with Louise Veselicky, D.D.S., associate vice president for health sciences academic affairs, to provide central coordination and support of health sciences faculty onboarding and orientation initiatives, contribute to faculty welfare initiatives and facilitate the integration and coordination of basic science instructional assignments across the five health sciences schools. Lockman earned her doctorate in pharmaceutical sciences with an emphasis in neuropharmacology from Texas Tech University Health Sciences Center. She has been active in research training and basic science education for over 15 years providing didactic and laboratory training in pharmacology, cell biology and general biology to thousands of undergraduate, graduate and professional students. WVU in the News: What is the WVU Medicine Center for Diabetes and Metabolic Health?